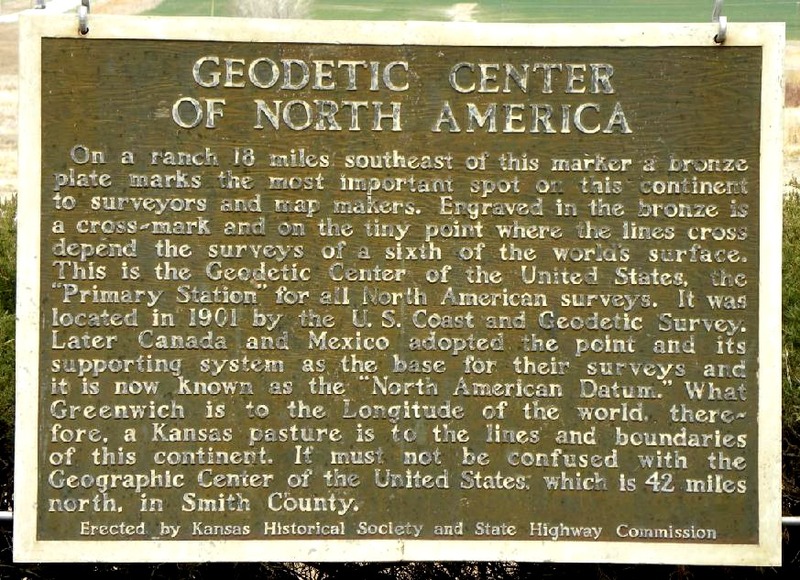 "Geodetic Center of North America"
Probably the most widely known of all triangulation stations in the United States, "Meades Ranch" is located in Osborne County in north central Kansas. This station was first established in 1891 as one of many points on the east-west transcontinental triangulation network along the 39th Parallel. It was named for a local homesteader named William H. Mead. 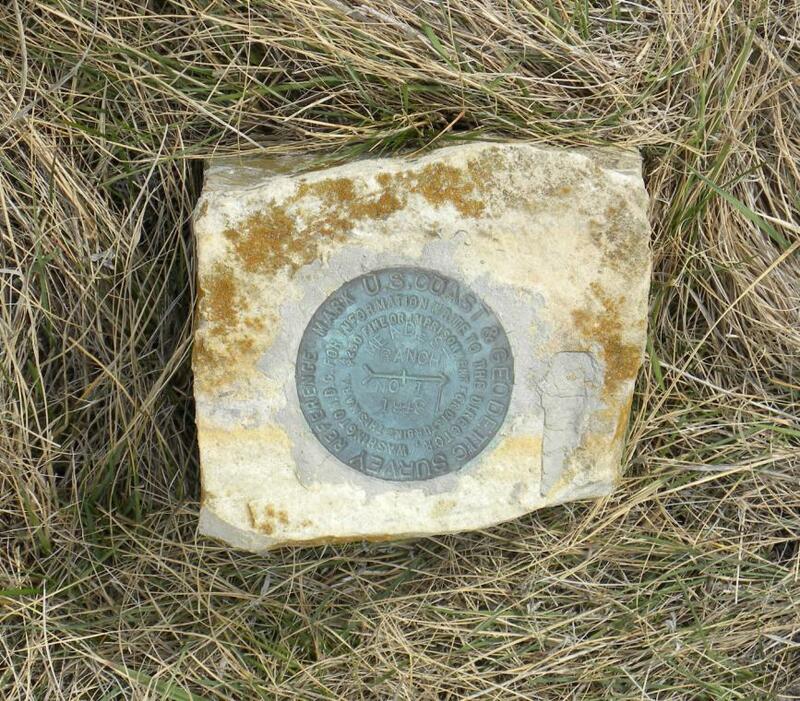 In 1897, two triangulation stations on the east-west network were chosen to begin the 98th Meridian Survey to go north to Canada. 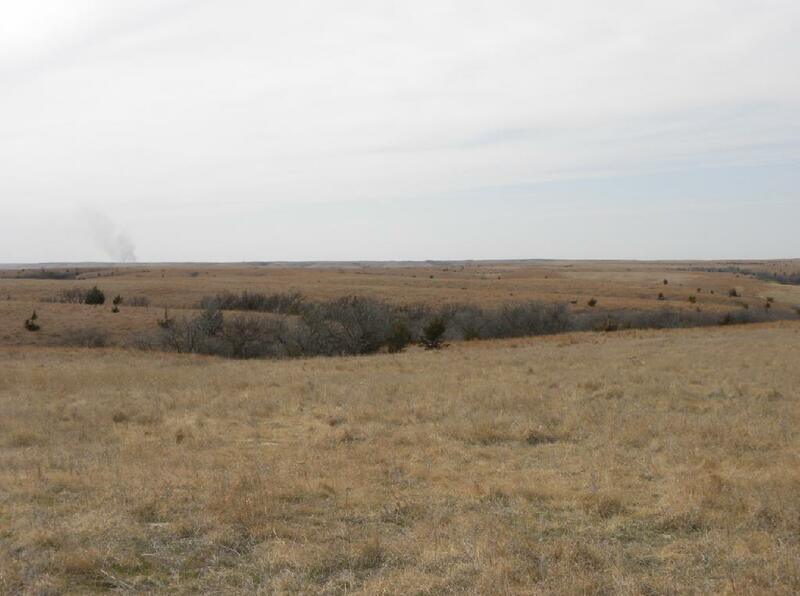 Station "Meades Ranch" and another station to the west known as "Waldo" became the two points on the south end of the 98th Meridian Survey going north. 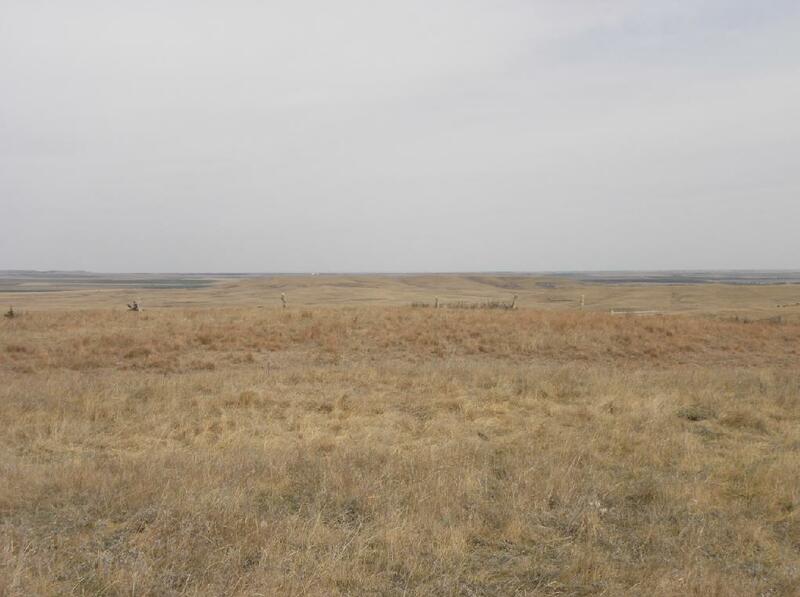 The 98th Meridian Survey also went south from this location to Mexico. At this point in time, "Meades Ranch" was still relatively unknown among the many triangulation stations established by USC&GS. 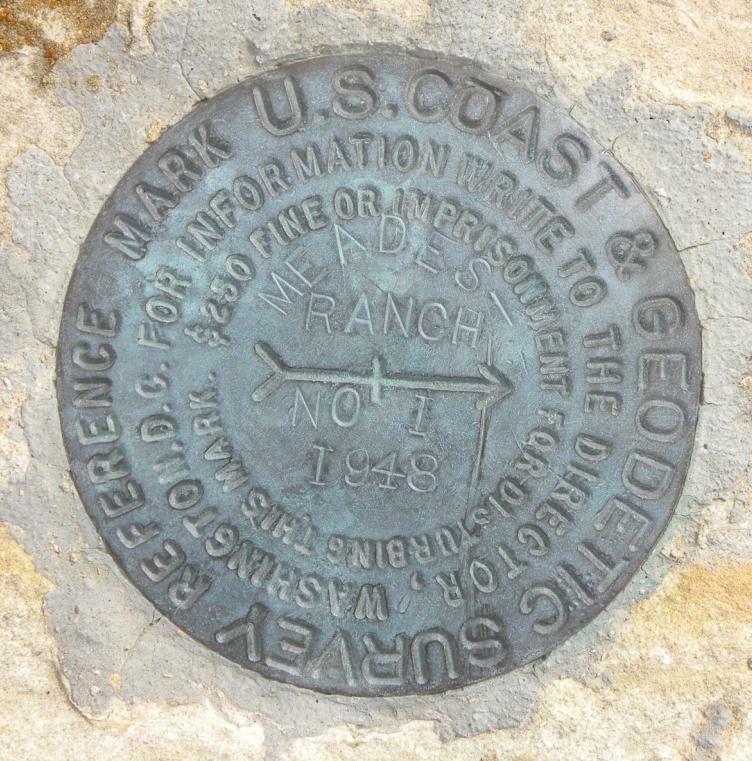 In 1901, "Meades Ranch" attained prominence when a new datum known as the United States Standard Datum was adopted. 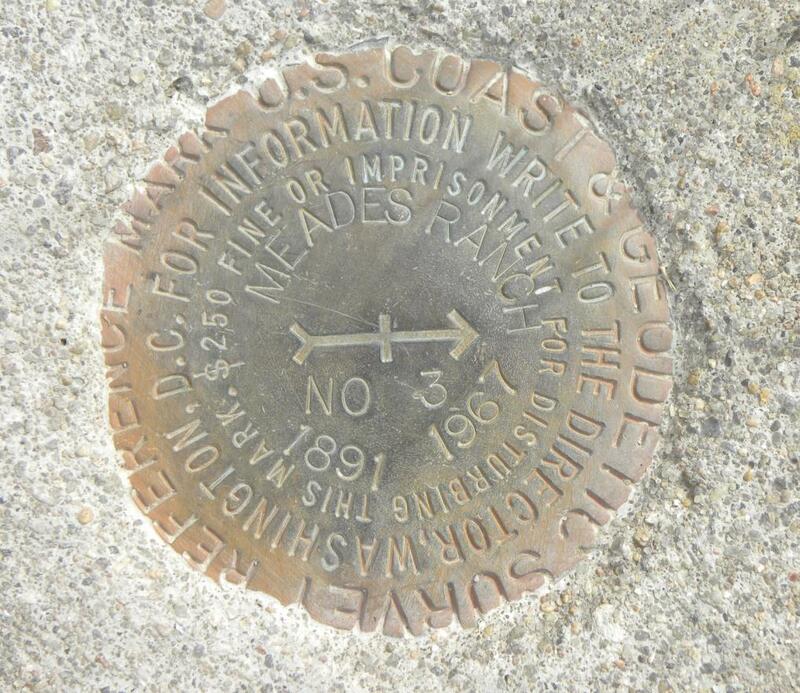 This datum operated on the assumption that the latitude of 39��.686� and the longitude of 98��.506� at station "Meades Ranch" was to remain fixed. 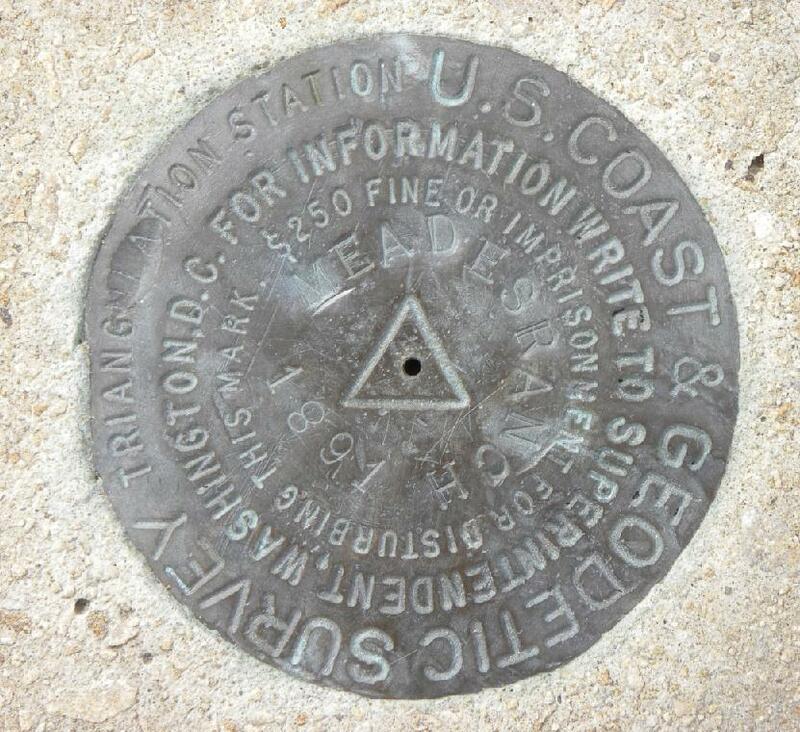 This station was chosen because it was at the intersection of two major triangulation networks and also because it was very near the center of the United States. Also, the azimuth from station "Meades Ranch" to station "Waldo" of 75��.52� (south azimuth orientation) would remain fixed. All other points across the entire nation were then adjusted from the fixed position at "Meades Ranch" and the fixed azimuth to "Waldo". The computations were based upon the Clarke Spheroid of 1866. 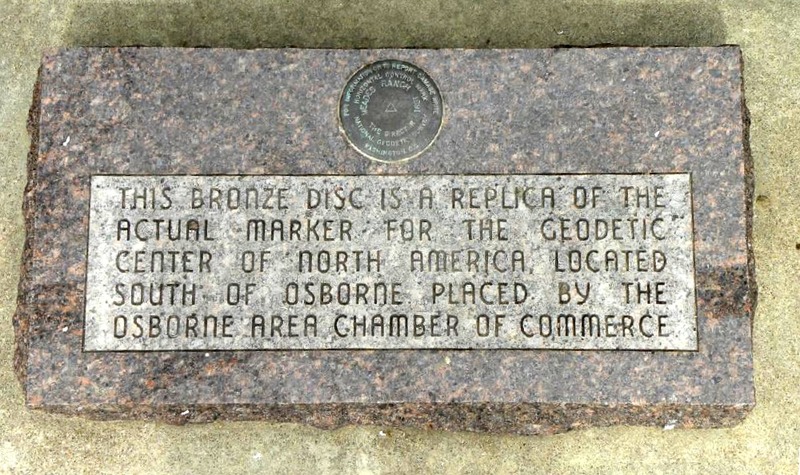 In 1913, the geodetic organizations in Canada and Mexico formally agreed to accept and base their networks upon the established network of the United States. 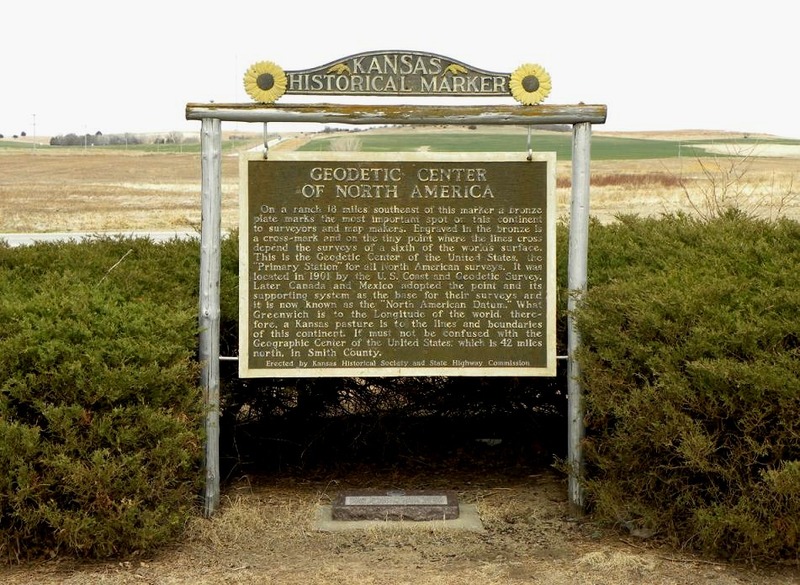 The name of the datum was then changed to the North American Datum and thus gave "Meades Ranch" even more prominence across an entire continent. As the triangulation networks of North America increased, and more isolated networks were brought into the system, acute problems kept arising in adjustments. To solve these problems all available primary data was readjusted during a five year period from 1927-1932 with again holding the position at "Meades Ranch" as fixed. The azimuth from station "Meades Ranch" to station "Waldo" was slightly adjusted to 75��.64�. This new adjustment became known as the North American 1927 Datum (NAD27) and included an estimated 25,000 stations. 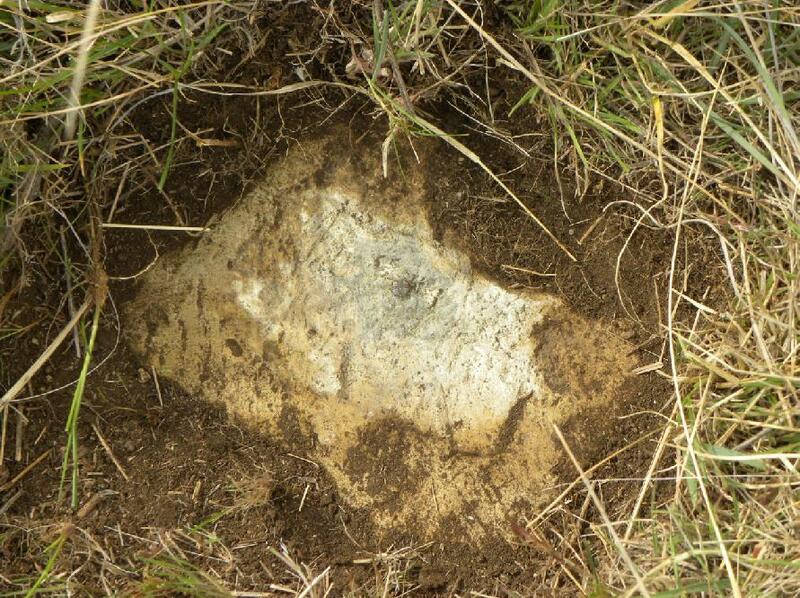 The original marker established at "Meades Ranch" in 1891 was an 8" square marble post. 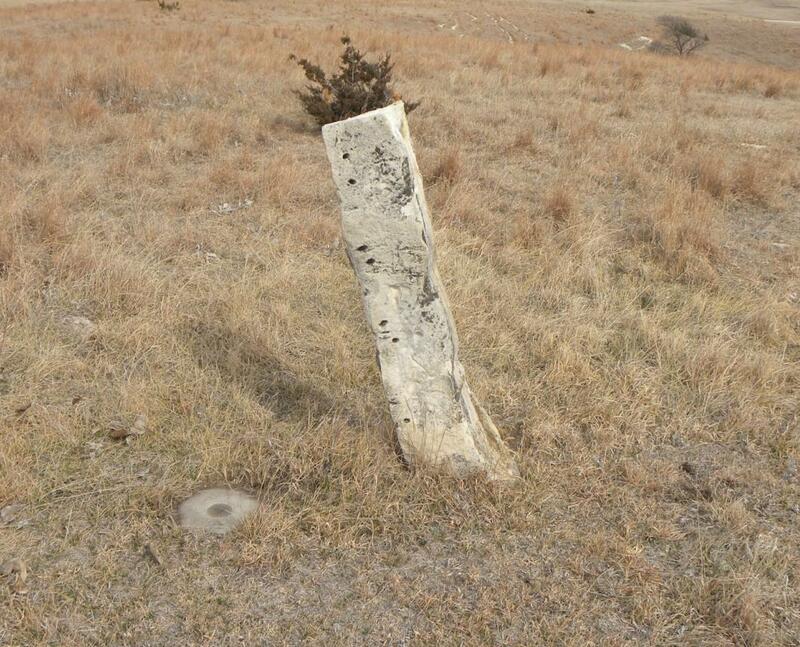 This marble post was replaced with a bronze disk in a square pad of concrete in 1922 and the two Witness Posts north and south were added. In 1948 the damaged station was rebuilt again with a bronze disk in a conical mound of concrete which remains as the monument today. In 1948, Reference Marks No. 1 and No. 2 were also added east and west of the station. In 1967, Reference Mark No. 3 was added. In 1986, the North American Datum of 1983 was officially adopted with the mass center of the earth as its datum point. 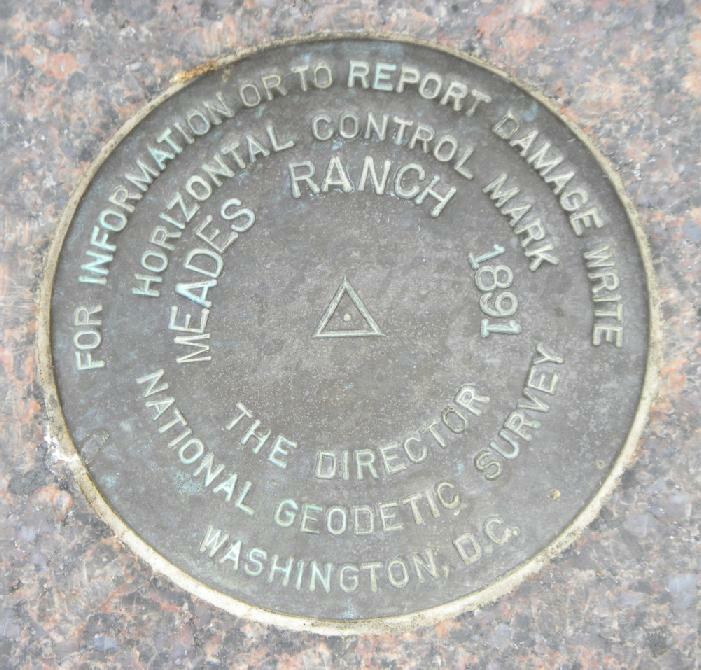 With the new adjustment and the NAD83 Datum now in place, "Meades Ranch" was no longer a prominent point with the change in the datum point and it became just one of nearly 250,000 other triangulation stations. 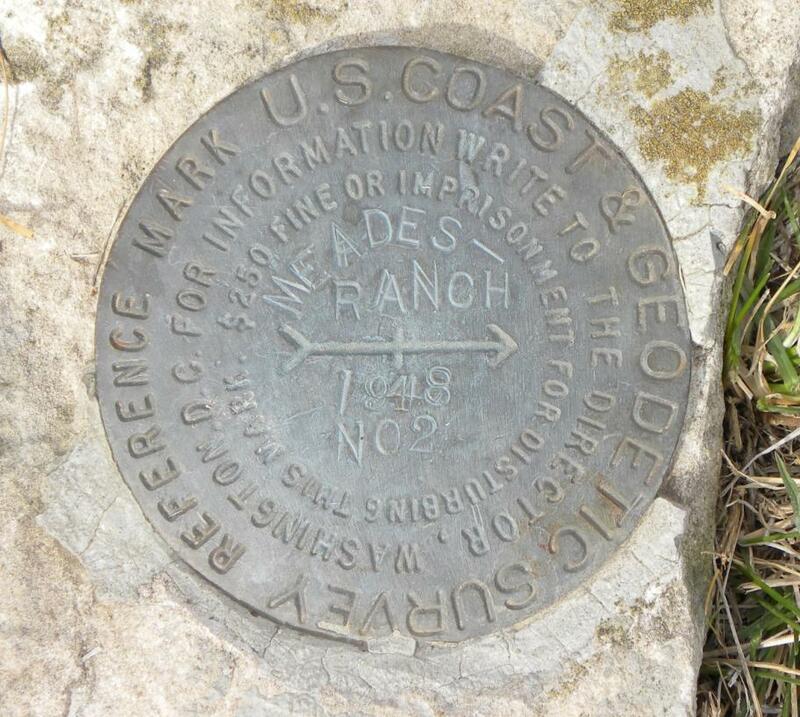 Surveyors, however, still hold this triangulation station with reverence since it was the focal point of all geodetic surveys from 1901-1986. with the advent of NAD83, the position on "Meades Ranch" that had been held fixed since 1901 was changed to latitude 39��.71982� and the longitude 98��.74686� (NAD83). The current position which has been updated with the use of GPS technology is now latitude 39�'26.71218" and longitude 98�'31.74604" (NAD83 2007). 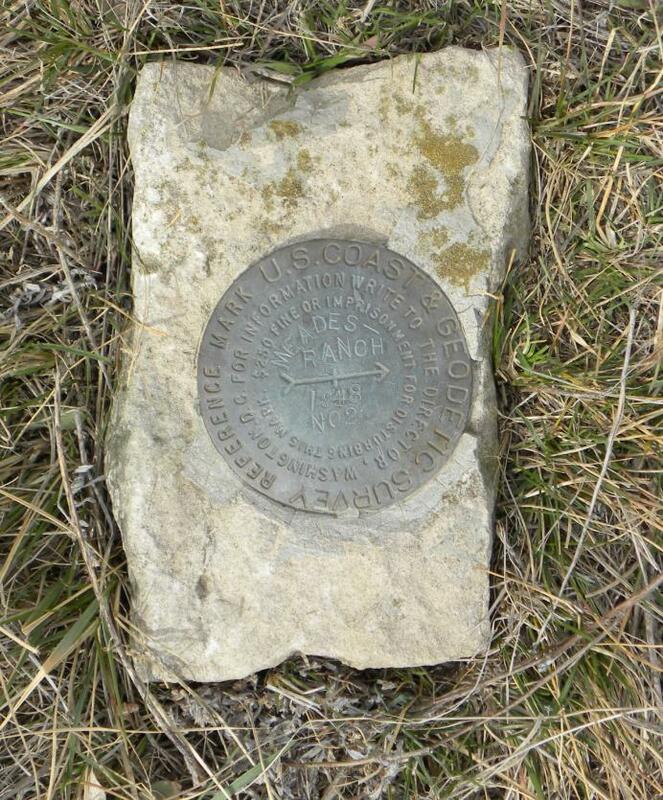 The monument in the ground stayed in the same location, but the position shift from NAD27 to NAD83 is approximately 3.54' north and 97.68' west. (97.74' diagonally to the northwest). Location of "Meades Ranch" in the southeastern portion of Osborne County, Kansas. 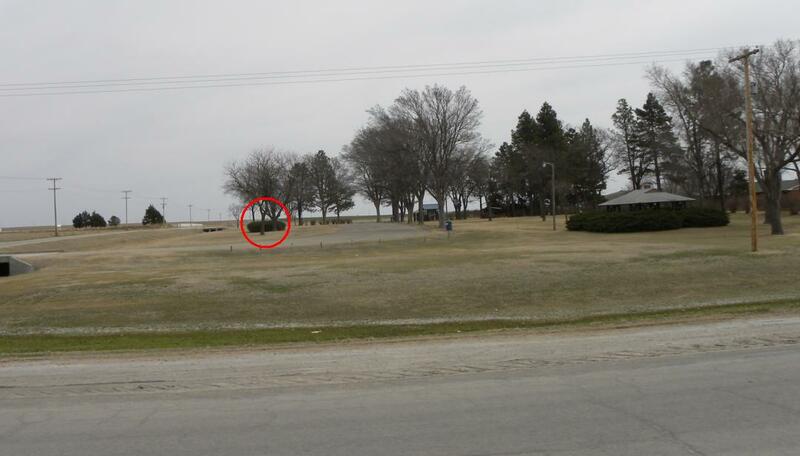 Roadside park just north of Osborne, Kansas, with a historical marker sign for "Meades Ranch". 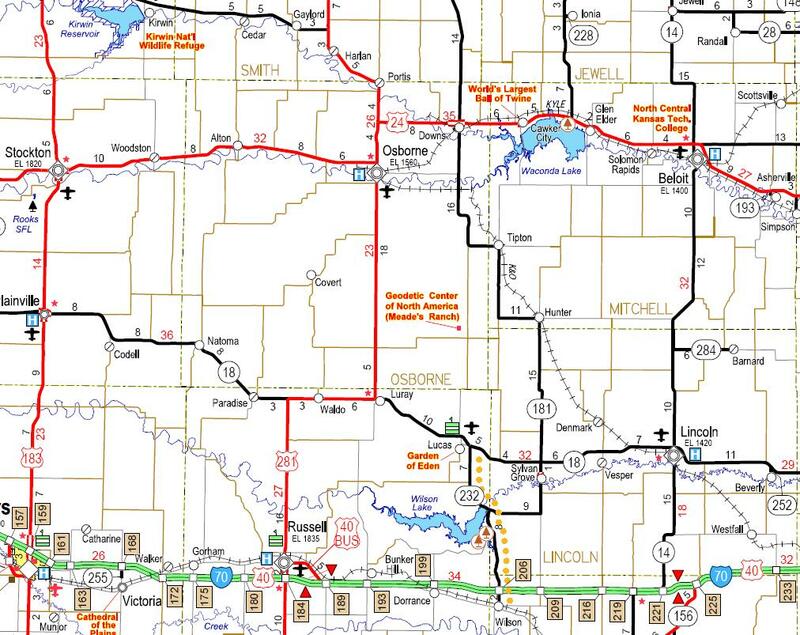 Located southeast of the intersection for Highways 281 and 24. Roadside park sign describing the importance of "Meades Ranch". (Looking north). Close up up historical sign at Osborne, Kansas. 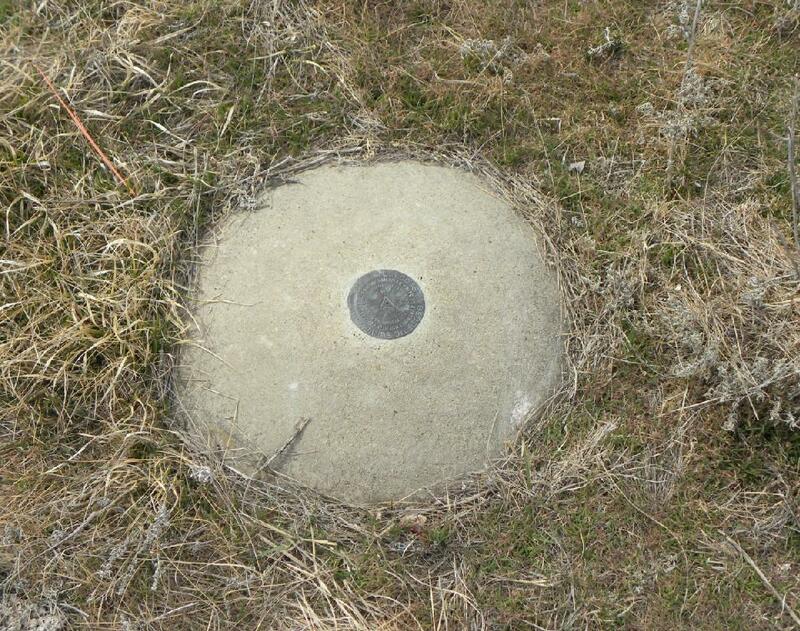 Granite marker with a replica of the "Meades Ranch" bronze disk. Close up of the bronze disk replica at the roadside park. 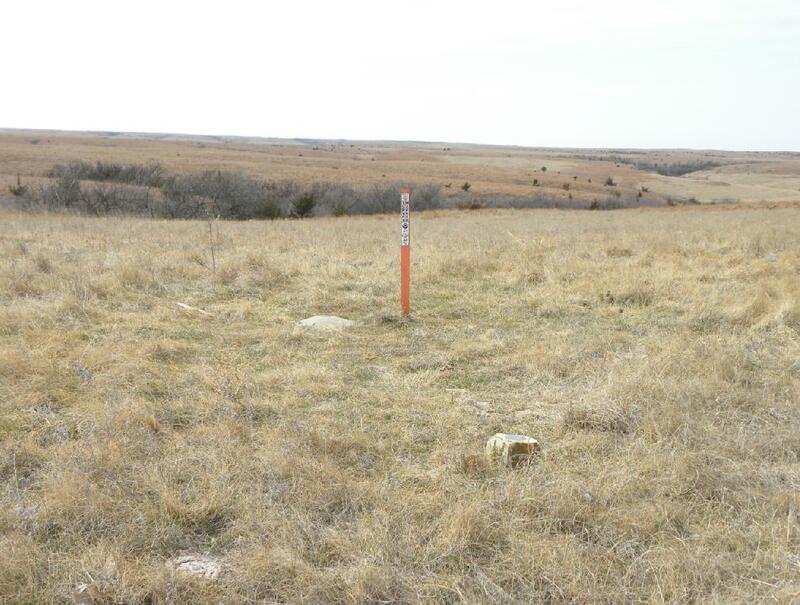 The triangulation station "Meades Ranch" (left of marker post), and Reference Mark No. 1 in the foreground. Photo is looking to the northwest. The "Meades Ranch" triangulation station as remonumented in 1948. 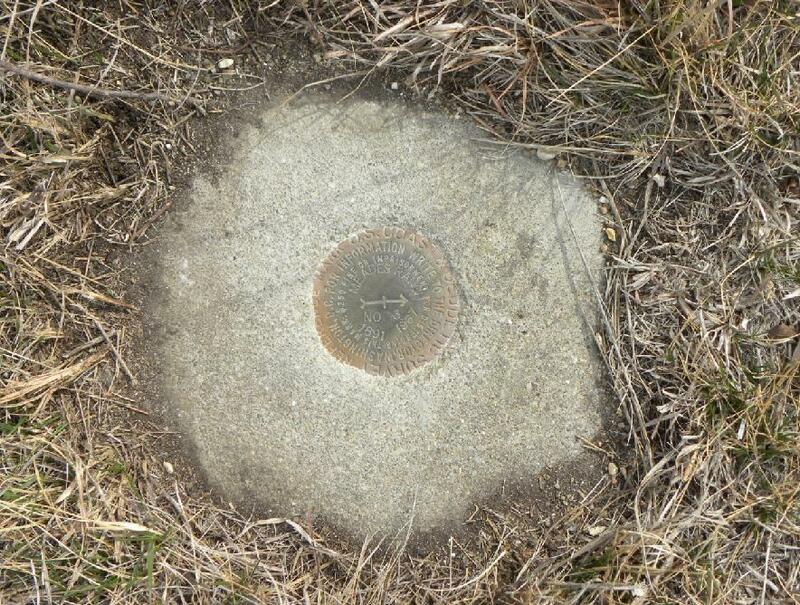 Close up of the 1948 bronze disk in concrete. Located North of the triangulation station. 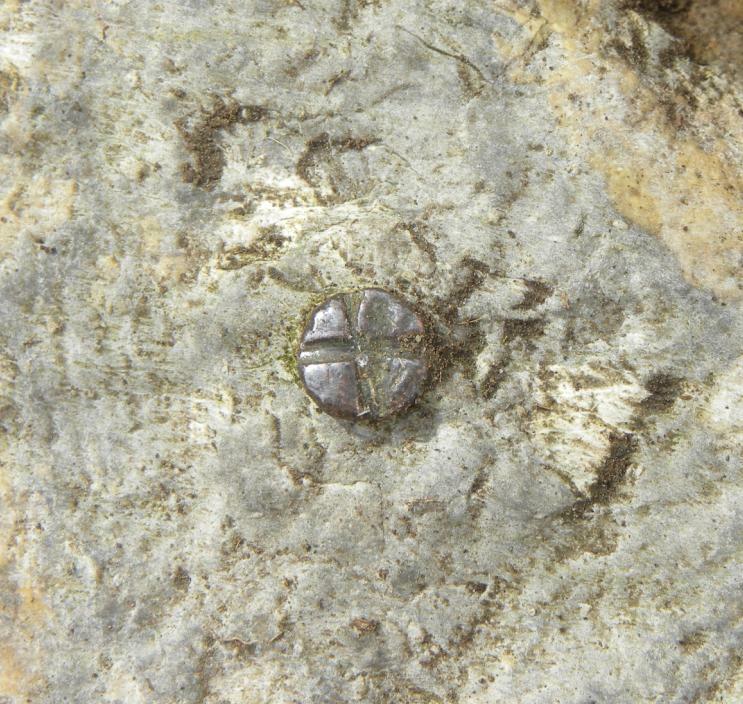 Close up of the small brass bolt with "+" in Witness Post North. Located South of the triangulation station. Close up of the small brass bolt with "+" in Witness Post South. 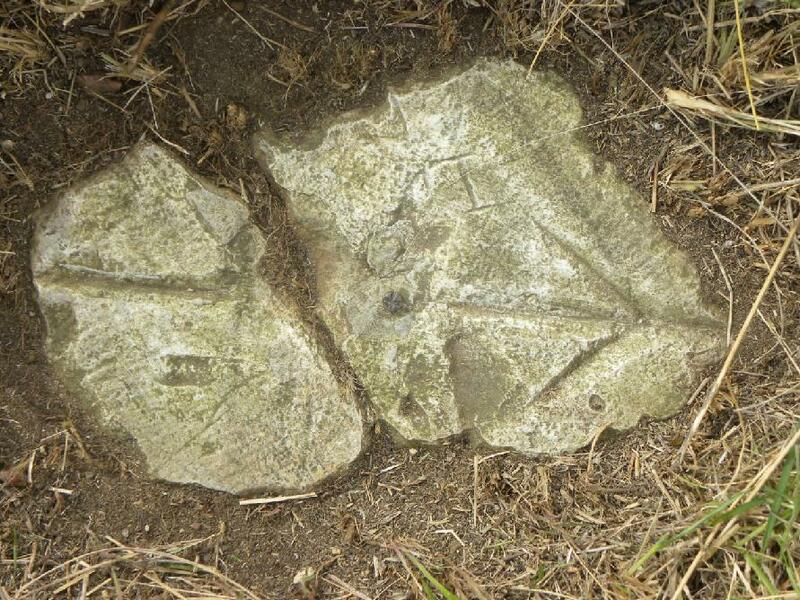 Located east of the triangulation station. Close up of Reference Mark No. 1. Located west of the triangulation station. Close up of Reference Mark No. 2. Reference Mark No. 3. 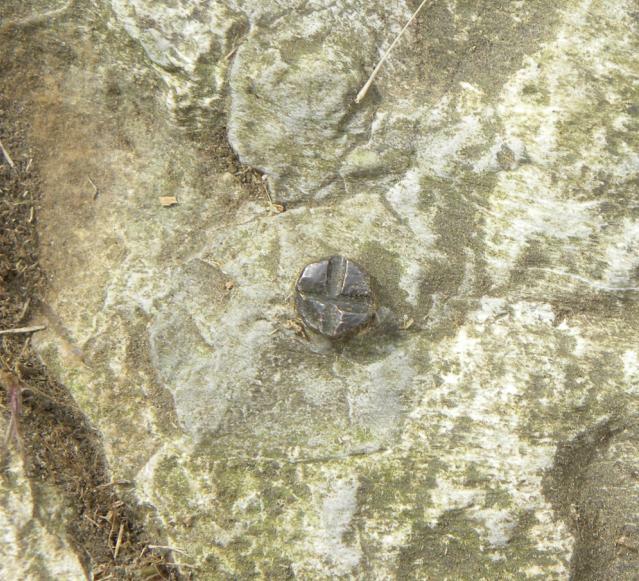 Next to limestone fence post on old north-south fence line. Close up of Reference Mark No. 3. View looking due north from the triangulation station. 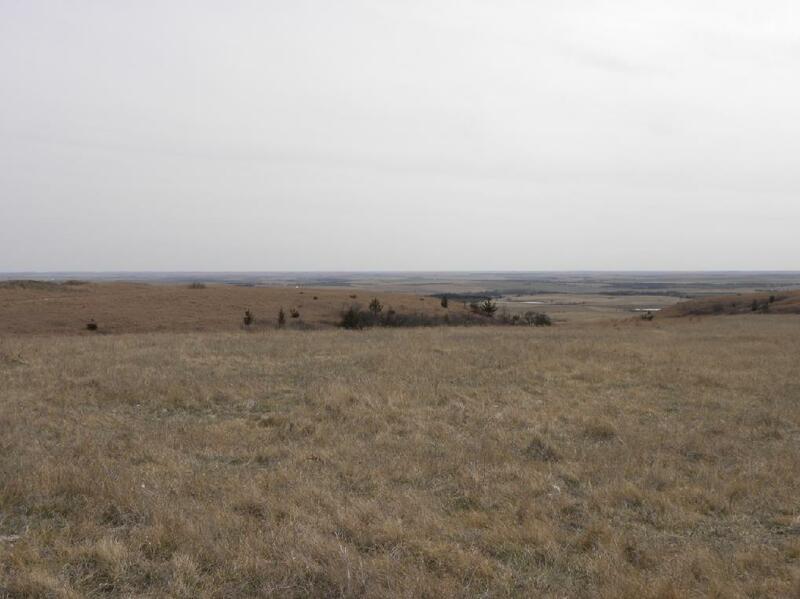 View looking due east from the triangulation station. Limestone posts are visible from north-south fence dividing the W 1/2 of the SW 1/4 from thre E 1/2 of the SW 1/4 of Section 34, T9S, R11W. View looking due south from the triangulation station. View looking due west from the triangulation station. 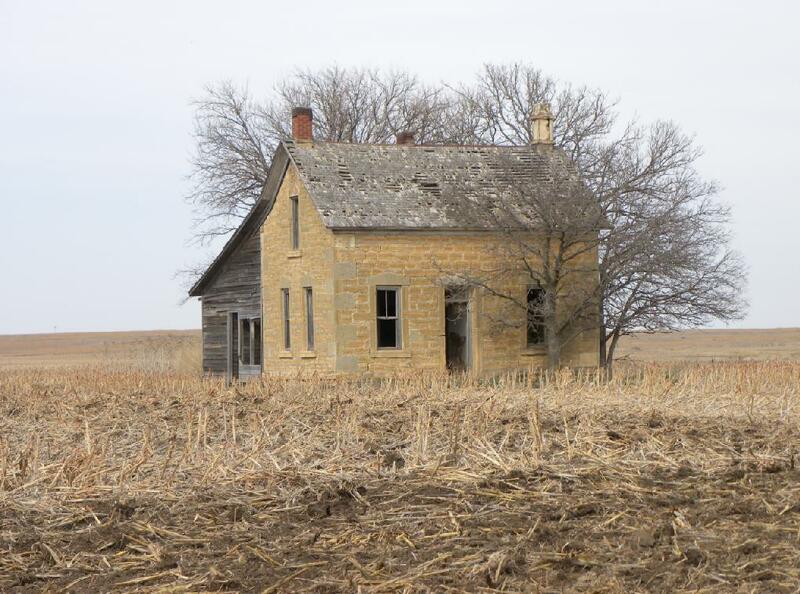 A typical Kansas old limestone house located 5 miles east-southeast of the triangulation station. 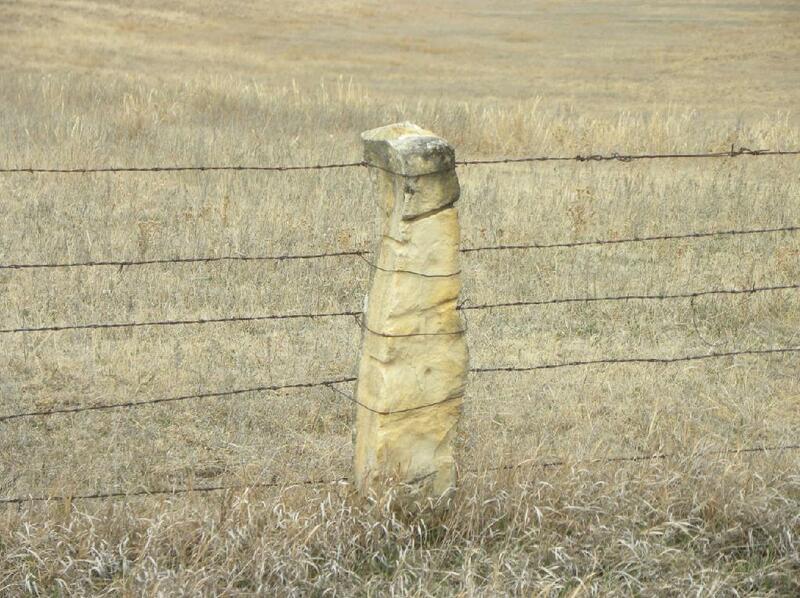 Limestone fence posts of this type are very typical in this area of Kansas. 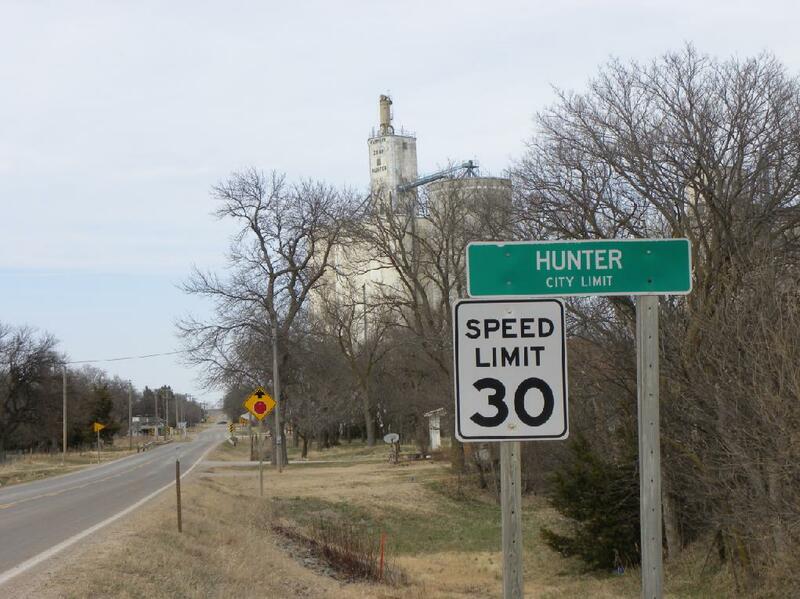 Entering Hunter, Kansas from the south on Highway 118. 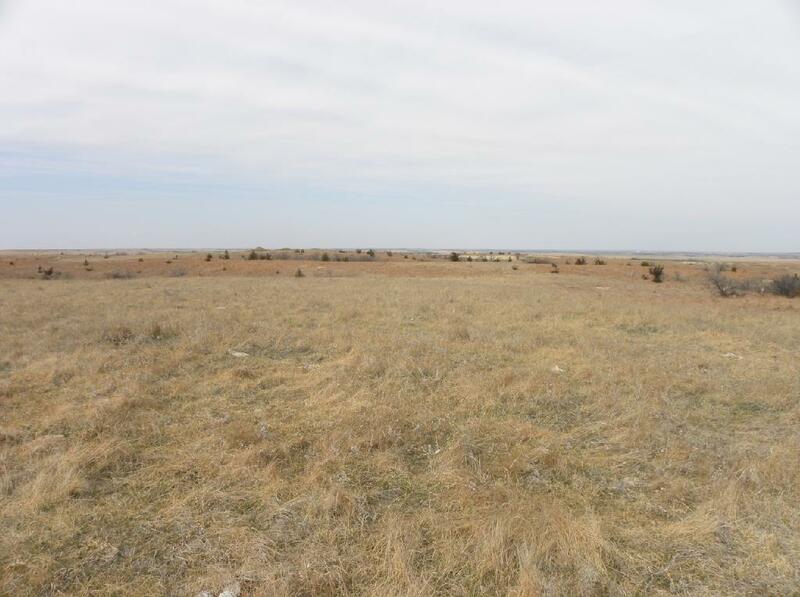 Hunter is the closest town to "Meades Ranch" being located approximately 8 miles to the east. 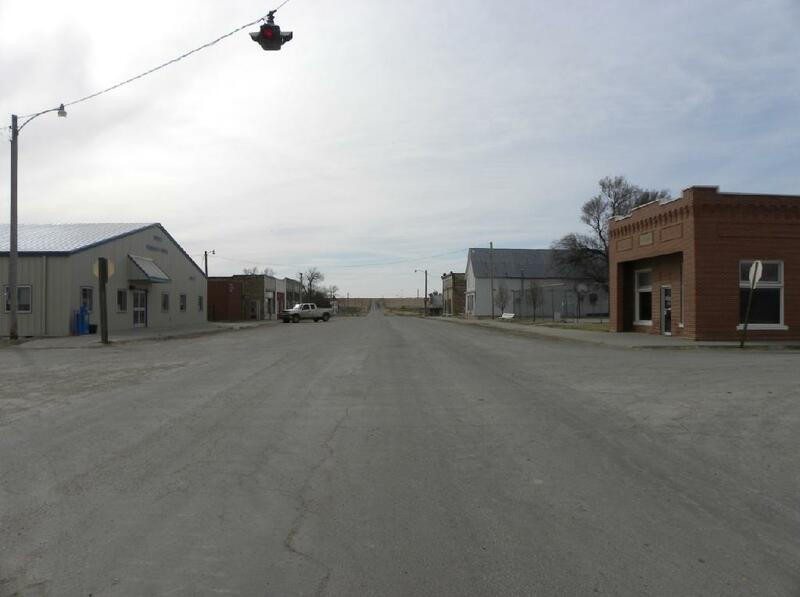 Main Street of Hunter, Kansas. (Looking west). 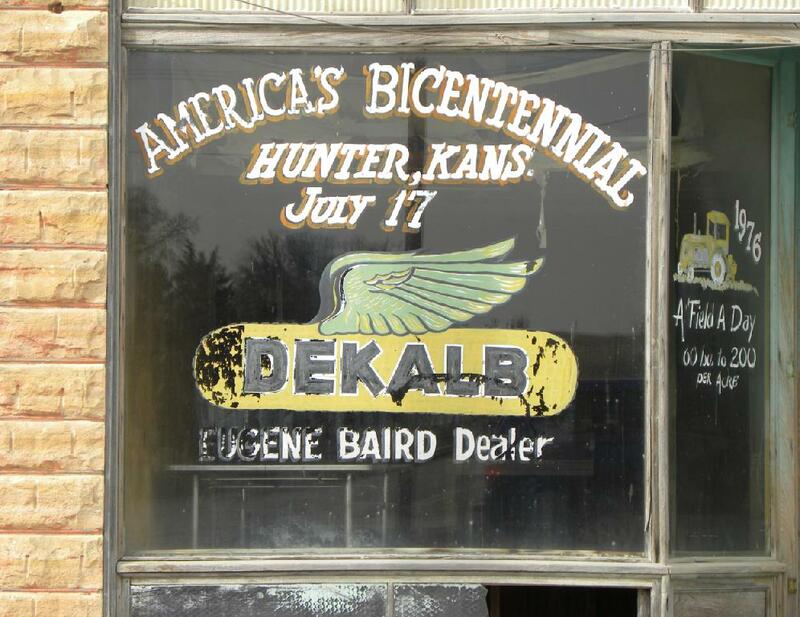 Lettering on an abandoned storefront window marking a timestamp in our history when the nation was looking forward to the 1976 Bicentennial. 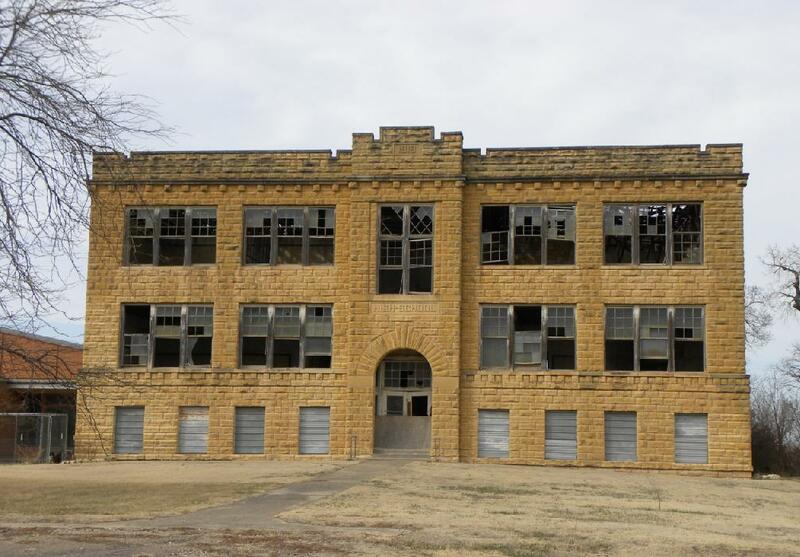 The abandoned Hunter High School built in 1918 has seen better days.